... in the car, owing to my not having realized that it was actually a rest day. Another day, I got to go over to Karen's house and meet her lovely blue spinning wheel. I actually got to spin alongside another person on a wheel! 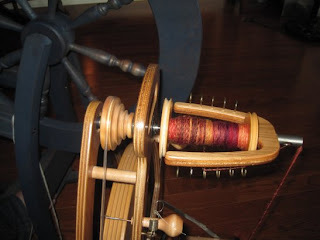 The only other time I've spun alongside somebody was also with Karen, last year when she was teaching me how to use a spindle. One more day to go with the Tour and I will be spending it plying everything I've done for the past two weeks. This will doubtless produce some panic since Karen showed me her stash of plied and ready to use handspun and I realized the awful truth: after you've spun the fiber, you still have to knit with it. And yet I bought more yarn today. Me: my own worst enemy. 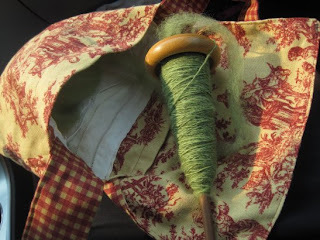 The second goal was to get through all of my fiber stash, which isn't going to happen, though I did make a pretty impressive dent in what I have and considering what has been happening around here that's a big deal. On the knitting front, I finished a sample I'm quite pleased with for something that's been nagging at me for a few weeks, yippee! and was grateful again for my vanilla socks when my friends decided to settle in for some time at the side of a river on a hot day. I absolutely love being able to whip out a sock wherever I happen to be stopped for a bit. When I carted a different one (which I plan to rip back, having decided the stitch pattern is ugly) through a museum on Thursday, three people asked me about it. One of them was about five and wanting to know what I was doing; when I said, "Knitting a sock", he said, "Cool!" and I had to agree. 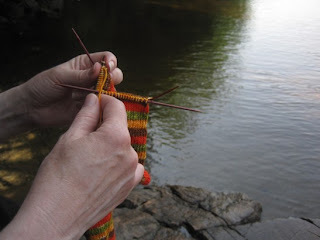 What I am doing now though is working on the last test sample for the Escapist mystery shawl. You know, in case you were wondering whether that was still on for the first week of August. That is a lovely project bag, lovely fiber too. I wonder how many people can brag that they can and have spun in their sleep? There should be a merit badge for that.